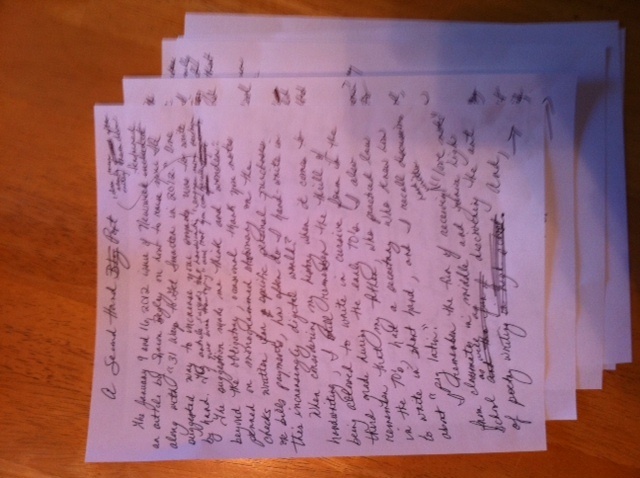 Note: This blog post was originally handwritten. The January 9 and 16, 2012 issue of Newsweek featured an article by Sharon Begley on how to raise your IQ along with “31 Ways to Get Smarter in 2012.” One suggested way to increase your smarts was to write by hand. The article suggested that handwriting “engages more sections of your brain than typing” and that you can recall ideas more easily after writing them down.The suggestion made me think and wonder: beyond the obligatory, occasional thank you notes penned on monogrammed stationery or the checks written for specific personal purchases or bills payments, how often do I handwrite in this increasingly digital world? When considering my history when it comes to handwriting, I still remember the thrill of being allowed to write in cursive form in the third grade during the early ’70s. I also remember that my father ,who practiced law in the ’70s, had a secretary who knew how to write in shorthand. And, I remember the fun of writing in “Pig Latin” with early childhood friends. I remember the excitement of receiving handwritten “love notes” from classmates in middle and junior high school as well as discovering the art of poetry writing. And, I can’t forget how “exotic” it felt to communicate via handwritten letters with a French Pen Pal during my ninth grade year. Such a global communication is so commonplace now, as we live in a world with global Facebook Friends and Twitter Followers. I can recall handwriting my high school valedictory speech, the verbal delivery of which was preserved in a VHS tape, and how could I forget the countless notes hand-drafted during my college courses or those two-hour hand-written college exam essays? Though I learned to type in high school, my transition from routine handwriting to the online digital world began with a Brother brand word processor in the early ’90s. I became fully entrenched in online technology and endeavors when I began working as a communications specialist on the former IBM PC Company division’s internal SAP software implementation. From that point, my online typing overtook my handwriting efforts. Over time, many of my most treasured keepsakes are hand-written cards, poems and letters from family, friends and loved ones. I own journals and boxes to store the memorable words that carry so much meaning. What about you? What have been your most significant personal writings? How have you maintained or honored those words? And, how often do you handwrite today? Maybe you should write your answers to those questions down. According to the Newsweek article and author Begley, your brain may appreciate your doing so. I relate to so much in your post, especially those first days of practicing my cursive writing on the cream or brown lined paper (also in the 70’s)! Thanks for the reference to the Newsweek article too. The SheCave idea is brilliant. Look forward to reading more! Thank you, Sandy! I’m glad that you enjoyed this post and like my blog idea! I look forward to reading your postings as well! I am really loving the theme/design of your site. Do you ever run into any web browser compatibility issues? A small number of my blog readers have complained about my blog not operating correctly in Explorer but looks great in Chrome. Do you have any recommendations to help fix this issue? Thank you for your comment, and I’m glad that you like the theme and design of my blog site. I haven’t run into any Web browser compatibility issues yet. What blog platform are you using?